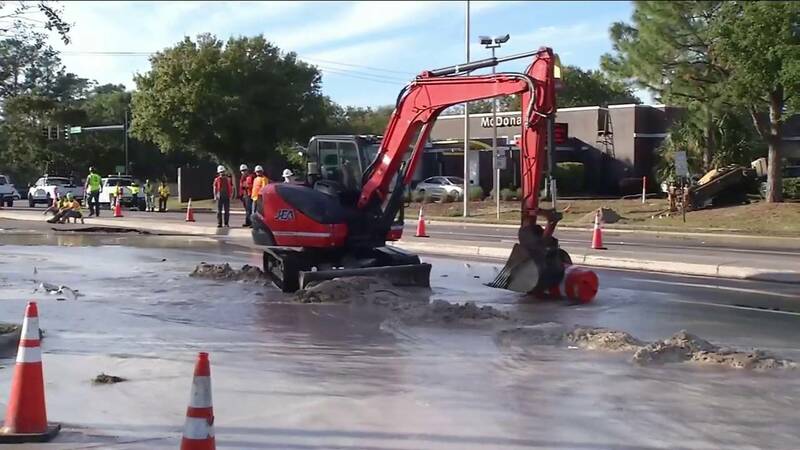 JACKSONVILLE, Fla. - Repairs for a water main break that shut down part of a major thoroughfare in East Arlington on Friday will force drivers to take the long way around for a few days. 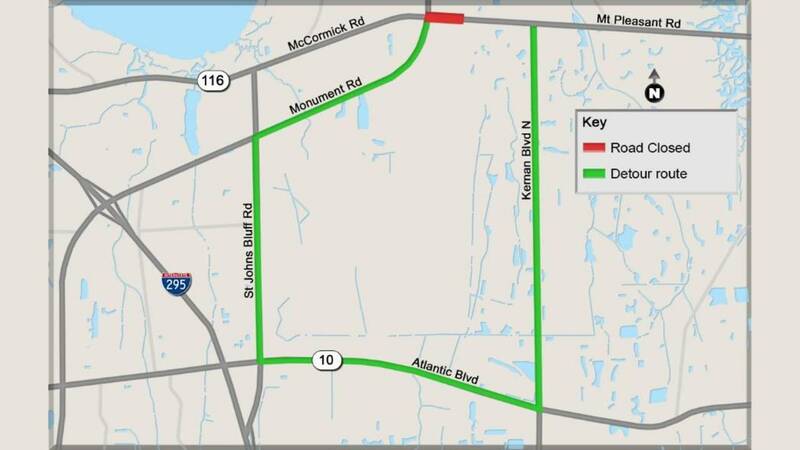 A section of eastbound McCormick Road between Monument Road and Kernan Boulevard will be closed from 8:30 a.m. Thursday to 6 a.m. Monday, according to the Florida Department of Transportation. Drivers will be detoured southbound on Monument Road to southbound St. Johns Bluff Road to eastbound Atlantic Boulevard and then northbound Kernan Boulevard. According to JEA, a Verizon contractor hit a 20-inch water main on Friday, spilling water all over the roadway and forcing McCormick Road to be closed in both directions for several hours. Eastbound McCormick remained closed from Friday afternoon to Saturday evening but crews were able to reopen the road. "I was first in line and the workers came over and stopped me. I could tell he was frantic," witness Chuck Mitchell said. "About 10 feet in front of me or so, both lanes, the asphalt started rising up and bubbling like you’re going to blow a balloon and it came up about 18-20 inches or so." No boil water advisories had to be issued. FDOT has selected J.B. Coxwell Contracting Inc. to make the emergency repairs. JBCCI will work 24-hours continuously until the repairs are complete, weather and unforeseen circumstances permitting, transportation officials said. For up-to-date information regarding construction projects, visit www.nflroads.com or contact FDOT personnel at 904-831-FDOT.